Everybody seems to grow their own herbs these days - but spices? From fenugreek to saffron, here's how to grow your own. Saffron is one of the world's most expensive spices, but it's possible to grow at home. It’s not hard to grow a bit of basil or rosemary for when you need a pinch or two in your pasta sauce, but spices – the stuff that gives a real kick to chai or curry or goulash – now that’s another matter. Spices, by which we mean things like ginger and cumin, have a reputation as being harder to grow at home than herbs, but to a large extent, it’s just that we’re not used to it here in North America. Ask any homesteader in Southeast Asia for a tour of the garden, and you’ll find plenty of spices. What’s the difference between a spice and an herb? Technically, herbs are seasonings that come from leaves. Spices are seasonings that come from any other part of a plant. Ginger is made from a root; cumin, coriander, and fenugreek are ground-up seeds; and saffron comes from the colorful stigmas inside a tiny flower. But it’s true that a number of spices are impractical to grow here, such as those that come from large tropical trees (like cinnamon and cloves). However, some tropical spices, like ginger, grow on small plants that can be cultivated during the warm season in North America. And many others are temperate species that are easily grown in average garden conditions. Here are growing instructions for a few you might consider trying yourself. 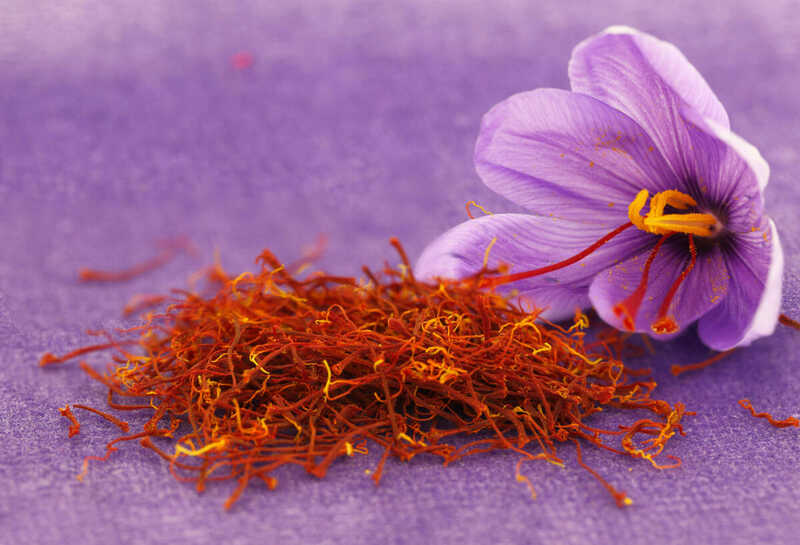 Saffron, one of the world’s most expensive spices, is the stigmas of a fall-blooming crocus bulb native to the Middle East and commercially cultivated throughout the Mediterranean basin. The saffron crocus is typically grown from bulbs planted 4 inches deep in mid to late summer; a location with full sun and rich, well-drained soil is best. Flowering occurs throughout the month of October. Each flower contains just three colorful stigmas which must be plucked by hand (or tweezers) and dried before use. You need a sizable patch to make much saffron, but it is a beautiful plant worth growing as a groundcover in a rock garden or at the front of a flower border. This tropical herb is hardy to about 15 degrees Fahrenheit but ceases to grow below 50 degrees. In the Deep South and in Southern California it may be grown year-round outdoors as a perennial, harvesting the roots as needed. In colder climates, start ginger indoors in late winter, and transplant outdoors once nighttime temperatures are reliably above 50 degrees. To grow ginger at home, cut up a hunk of store-bought ginger into 1- to 2-inch pieces, making sure there is a pointy “node” – the part of the root capable of sprouting into a leafstalk – on the top of each piece. For best results, use the freshest-looking organic ginger you can find, as conventional ginger may be sprayed with growth inhibitors that prevent it from sprouting. Leave the pieces on a plate at room temperature for two days to let the cuts callous over (become dry) before planting. Plant the pieces with the node pointing up about 4 inches deep in rich, well-drained soil in a partly sunny location. Cover the pieces with just an inch or two of soil at first. Once the ginger has sprouted above the height of the hole, fill in the soil back to the original level; the new roots will form in this area just below the soil. (If growing indoors you can do this part in a 1-gallon pot). Water and fertilize frequently to produce large, flavorful roots. In colder climates, you’ll be able to harvest “baby ginger” in early fall when the weather cools off. In areas with mild winters, the roots should mature to the size of what you find in the grocery store by December. If you have space indoors, you can keep ginger plants year-round in a 5-gallon pot. If you do, just be sure to mist the leaves at least once a week to provide a humid environment. Turmeric is closely related to ginger and is grown in the same fashion. One minor difference is that the roots are more tuberous in shape, without pointy nodes; instead, the nodes are the little knobby lumps that protrude from the root, so make sure you have at least one of these on each piece you plant. Also, turmeric does best when planted just an inch or two deep – simply place it beneath the soil at this depth and fill the hole back to the original level. Coriander is the seeds of cilantro, the common annual herb. This cool weather plant may be grown in both fall and spring but does not survive the heat of summer. In spring, sow cilantro seeds directly in the garden immediately after the average date of the last frost in your area, choosing a sunny or partly sunny location. Alternatively, in mild winter areas, you can also sow cilantro seeds 8 to 10 weeks before the average date of the first frost in fall, and it will overwinter and produce seeds the following year. Harvest the leaves all you want (without removing the entire plant) through the spring. In late spring or early summer, cilantro will put up small white flowers, which will soon turn into seeds that look like tiny green peas. After the seeds have turned brown, clip off the stems and cinch them into bouquets inside a brown paper bag to finish drying indoors. Many of the seeds will fall off into the bottom of the bag, but once the stems are completely brittle, dislodge any remaining seeds by rubbing the seedheads between your hand, letting the seeds fall into a bowl. Store the dried seeds in a glass jar. You may use them whole or grind them into a powder with a coffee grinder as needed. (Purchase a dedicated coffee grinder for this purpose, as the flavor of the spice will be forever embedded in it). Cumin is in the same plant family as coriander and is grown and harvested in much the same fashion. It is a heat-loving species, however, and requires a long, hot summer to mature. For best results, sow cumin seed indoors in flats 4 to 6 weeks before the average date of the last frost, and transplant the seedlings to a sunny place in the garden about 2 weeks after the average date of the last frost. By early fall, the seedheads should be turning brown and are ready to harvest. Fenugreek leaves are occasionally used as seasoning, but the plant is mostly grown for its seeds, which are used extensively in Indian cuisine. Growing and harvesting requirements these heat-loving species are nearly identical to cumin. One tip, however, it to start fenugreek seeds indoors in biodegradable peat pots, which may be planted directly in the ground, as the process of transplanting from plastic pots tends to damage its delicate root system. Paprika is nothing more than the dried and ground flesh of a bell pepper. “Sweet paprika” comes from sweet bell peppers, while “hot paprika” comes from varieties that pack more of a punch – though truly hot peppers, like cayenne and jalapenos are not used to make paprika. The best pepper varieties are thin-skinned because they are easiest to dry; the typical thick-walled grocery store bell peppers are prone to turning slimy and rotten faster than you can dry them. ‘Leutschauer’ is a traditional medium-hot paprika pepper from Hungary. ‘Dulce Rojo’ is an example of a sweet paprika pepper. All peppers are heat-loving plants that must be started in late spring, and grown through the summer. Allow the fruit to mature until it is deep red. In the dry climates of the western US, thin-walled peppers are easily dried by hanging them in bunches from the kitchen ceiling; in the rest of North America it’s better to slice them and dry them in a dehydrator, or in the oven at the lowest possible setting (around 140 degrees Fahrenheit is ideal). Once the peppers are dried to the point of being crumbly, remove the seeds and grind them into a powder with a coffee grinder.